The Hush Ultra Absorbent Mattress Protector is a one-of-a-kind product meant for people who like to dine or kick back in bed, perhaps whilst enjoying a romantic evening in watching a movie, et cetera. A high-tech product that repels liquids or spills of any kind - this mattress protector (waterproof) is breathable, and does not allow for any seepage on or in to the mattress. These features ensure that your mattress protector (waterproof) continues to possess a good hygiene and long-lasting freshness, thereby leading you to own it for a long time to come. This mattress protector has a (waterproof) top layer made of ultra-absorbent cotton terry and a bottom layer that possess a PU coating. 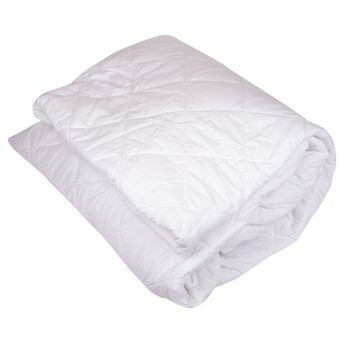 This mattress protector can be machine-washed about a hundred times, depending on personal usage. Explore the entire range of Baby Bedding available on Nykaa. Shop more Hush products here.You can browse through the complete world of Hush Baby Bedding .Alternatively, you can also find many more products from the Hush Ultra Absorbent Quilted Mattress Protector range.